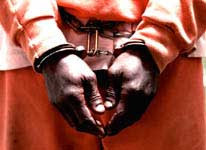 It is estimated that the Government of Ghana would spend an mount of 16 million cedis on each prisoner in Ghana this year, having already spent 10.4 million on each prisoner last year. Mr. Kwamena Bartels, Minister for the Interior, said the calculation was based on the total expenditure of the Prisons Service to care for prisoners.Answering questions in Parliament, on Wednesday in Accra, on issues for which the Ministry is responsible, Mr. Bartels said there were 13,800 prisoners in Ghana. Out of the number, 713 were prisoners who were foreign nationals from 25 countries from Africa, Europe, the Far East and North and South Africa.There were 4,218 prisoners on remand trial. The question stood in the name of Mr Charles Hodogbey (NDC-North Tongu).Mr Albert Kwasi Zigah (NDC-Ketu South) asked when accommodation facilities at the Aflao Police Station would be upgraded. The Station was said to have been established in the 1950's, but without any major rehabilitation. Mr Bartels said Government was tackling the problem of accommodation of the Security Agencies, including the Police holistically.The Minister said the Ministry had come out with proposals to handle the situation, adding that attempts were being made to source the requisite resources both locally and internationally. He said more than $120 million would be needed for the housing and office accommodation project for the security agencies. Mr Bartels said the funding would be part of the 2008 supplementary budget proposals to be submitted to Parliament, and that the Security Services, including the Police had been asked to submit a list of all uncompleted projects with cost implications. "A committee has been set up to assess the total budgetary implications for the completion of projects to enable the Ministry source funds to complete them", Mr Bartels said.The Minister accepted a suggestion from Mr Francis Aggrey Agbotse (NDC-Ho West) to establish an enquiry into reported cases of foreign registered motorcycles from the Republic of Togo, who operate along communities of the Ghana Togo border.Mr. Agbotse had asked why the Police allowed them to operate in such towns as Kpedze, Aflao, Shia, Kpetoe, Nyive and Dzodze, all in the Volta Region.Minister Bartels said the Volta Region had never identified any of such perpetrators and left them off the hook as alleged. He said information gathered from the Customs, Excise and Preventive Service and the Ghana Immigration Service indicated that such motorcycle owners drop their "passengers" on the side of their border and return to Togo but do not return to Ghana for commercial purposes. The Interior Minister announced that the Ministry had entered into negotiation with the ECOWAS Bank for Development for a loan of $24.7million to procure new fire tenders for distribution to Fire Stations throughout the country. The response, which was to answer a question by Mr Gershon Gbediame (NDC-Nkwanta South), which sought to know when a fire tender would be supplied to the Nkwanta District Fire Station. Mr Bartels said the Nkwanta Service Station would be considered under that programme. folks I've read stuff from. I appreciate you for posting when you've got the opportunity, Guess I will just bookmark this page. My site has a lot of exclusive content I've either written myself or outsourced but it looks like a lot of it is popping it up all over the internet without my agreement. Do you know any ways to help stop content from being ripped off? I'd truly appreciate it.